About 100 000 years ago the earth was in an Ice Age. No, this is not about my last date… During that period, most of northern Europe was covered in ice and snow. In the north-east of Holland lies the province of Drenthe. Nowadays a nice place to be and lots of things to see. However, some of the things you can see are not very common in the world. This province has “Wandering Boulders”. Well, they don’t wander anymore, I can assure you, but they did move a few thousand kilometres during the last ice age, thanks to the moving ice. The boulders came from the north, today’s Scandinavia. These boulders have been placed in a specific pattern for a specific use about 5000 years ago. That means that these monuments are older than the Egyptian pyramids! 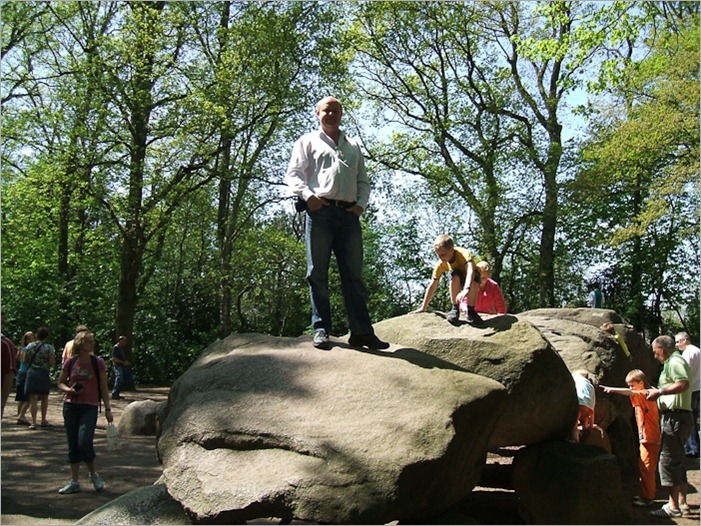 The original name of these monuments is “hunebedden” from the old Dutch for Hune or Huyne meaning Giant and Bed. Well, the name might explain everything, but… no. It does not. The stones have not been placed here by giants and they have not been used as beds. Anyway, even a giant must have enough brains to understand that this is a rather uncomfortable way to spend the night. 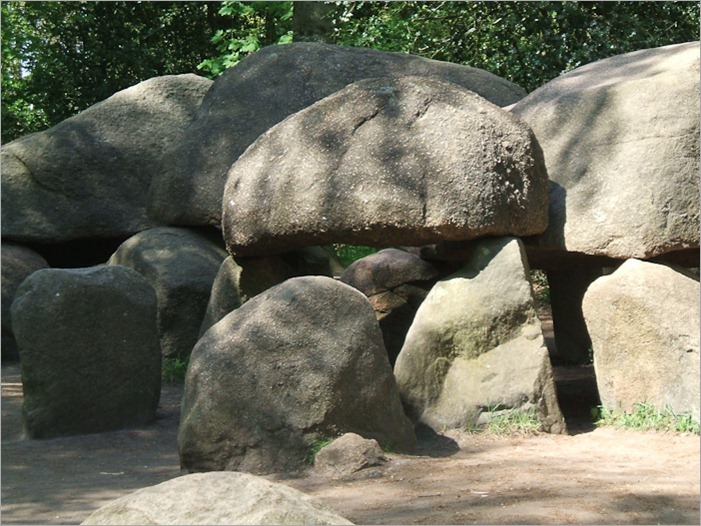 The stones have been compared to the Dolmen in France’s Bretagne, but there are still some significant differences. Here, the stones are placed together and covered with even bigger stones. The entrance to the chamber is on the long side for example. The stones are placed in an East-West alignment. Today, we cannot move these stones without heavy equipment. 5000 years ago they did it by hand. The secret of these monuments? Well they were burial chambers. What is left today is only the skeleton of the complete complex. The stones we see today were covered in earth, and the gaps filled with smaller stones. The floor of the chamber was paved with mostly flat stones. Only the bigger stones were visible on the top of the monument. Before creating these burial chambers, the farmers that lived here were hunters. Hunters that changed their lifestyle to grow wheat and other things. Now they wanted to stay in one place and make sure that whatever they left behind would stay there for eternity. Big stones, heavy enough to fit the bill were lying around in the countryside. So that’s what they used. 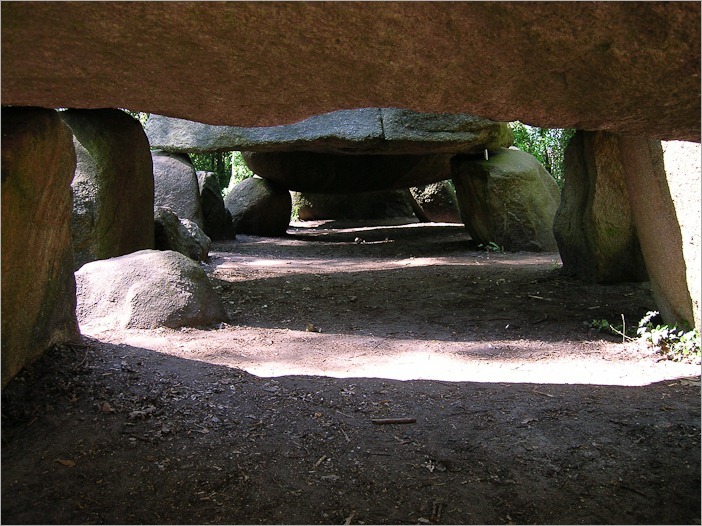 A difference with the Dolmen in France is that these burial chambers were closed with a rolling (roll-able) stone. In France they are not. Also the stones are much bigger than the ones used in France. 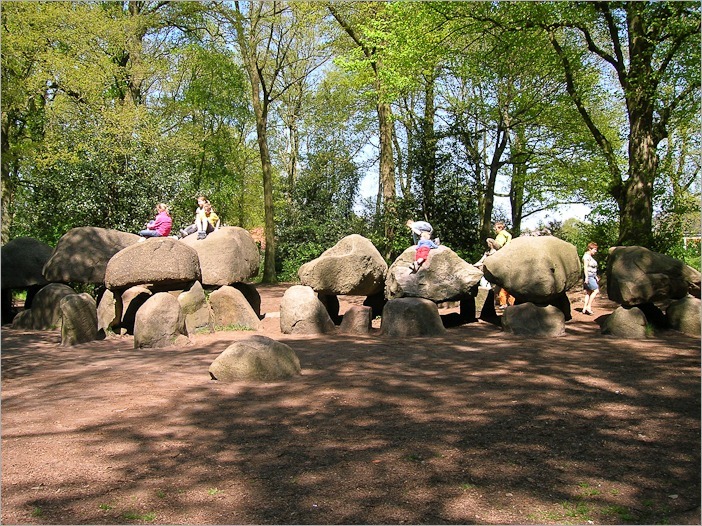 Today the stones are a favourite place for children to play. Who cares if 5000 years ago people were buried here? Holland counts 54 of these monuments all dating from the same period. All also have the same function, but sizes differ. Today we know much about the people who built these graves, we know how they lived and where. We know what kind of “kitchenware” they used, the people were the Funnel-Beaker people. So is there no mystery? Yes there is. The big question remains unanswered. Why did these simple farmers make such a tremendous effort to drag those heavy boulders to a construction site and pile them up to making a huge stone grave? And how on earth did they do this…? One thing must be the same between the Beaker People and us when looking at these works. The feeling of astonishment and awe.